The vaping community is as much about individuality and personalization, as it is about great taste and choice. Whether you are new to vaping, or have been vaping for a while, you will eventually think to yourself "I wish I could get a flavor that tastes like..." or maybe even "I wonder if I could make something myself that is just as good as..." Finding a vape that you enjoy is hard enough, finding a vape that is exactly what you want can be next to impossible. So...you have Googled "how to make e-liquid" and you have found yourself here, and we want you to know that we are super excited to help guide you through your journey to create the perfect E-Liquid. It helps to think of DIYing E-Liquid like making your favorite batch of cookies. What you will need is a list of ingredients, some basic equipment, and some simple instructions for how to put it all together. From there you can experiment with what you have until it becomes your own. With your personal flavor formula dialed in, you will have a vape you know you love, can same money by making it yourself, and maybe even receive bragging rights within your local vaping community. Diluted Nicotine: If you are vaping e-liquids that contain nicotine you will need to order some for your recipe. It is important to note that nicotine has its own distinct flavor profile and will slightly alter the flavor and sensation of your E-liquid. The more nicotine, the more prominent this will be. Diluted nicotine comes in a number of strengths. These include 26mg, 36mg, 48mg, 60mg, and 100mg. Most individuals prefer to mix with 100mg nicotine as it is easier to measure and a little bit goes a long way. In this tutorial we will be mixing with 100mg nicotine in a 120ml bottle. DIY Flavor Shack Inc. offers three different nicotine dilutions. VG, PG, and 50%VG/50%PG. It is important to note which VG/PG ratio you are trying to achieve when mixing your e-liquid before selecting the base of your diluted nicotine. For example, an individual looking to create an e-liquid that contains Maximum VG would select a VG based diluted nicotine. Warning: Please note that nicotine at any dilution is a toxic substance. It is important to wear appropriate Personal Protective Equipment (i.e., gloves, apron, eye protection) and mix in a well ventilated room. Nicotine is highly toxic and needs to be handled with the utmost care. If you get it on your skin immediately wash with water and soap until it is completely removed. If you ingest diluted nicotine please contact poison control immediately. If you get it in your eyes immediately flush eyes with water for at least 10 minutes and contact poison control. Seek immediate medical attention. Ensure that you are using all precautionary measures when handling and storing diluted nicotine. Propylene Glycol (PG) and Vegetable Glycerin (VG): When mixing your own e-liquid you will need VG and/or PG to add to your recipe. Nicotine and flavorings are highly concentrated and need to be diluted for a pleasurable vaping experience, so you will use PG and/or VG as the "base" or "carrier fluid" making up most of the volume of your E-Liquid. There are nuanced differences between PG and VG. They have slightly different tastes, viscosity, and throat feel when vaped. Most E-Liquids have a mix of both presented as a ratio of VG to PG. Common ratios are 70/30, 50/50, or 30/70. Flavor concentrates are generally diluted with PG, which is why you will commonly see MaxVG as the description rather than 100% VG. Both PG and VG are perfectly fine for vaping, but you will probably want a little of both to experiment with different ratios if you are just getting started. Propylene Glycol is an organic chemical compound that is widely used in food, tobacco, and personal care products. It is also used in topical, oral, inject-able, and inhaled pharmaceutical products. PG doesn't alter the true flavor of the flavor concentrates as much as VG can. Also, PG delivers a stronger throat hit, which can result in slight irritation after extended use. It is rare, put some people have or develop an allergy to PG. Vegetable Glycerin is slightly sweeter and slightly more viscous (thicker) than PG. Higher VG ratio E-Liquids may take slightly longer to soak into a cotton wick, for example. VG can slightly alter the way a flavor tastes, but that can be good or bad depending on your individual taste. High VG is usually preferred by "drippers" using cotton and coil atomizers, because it has a smoother throat feel and generates a more visible "cloud". Flavoring: The last thing you will need is some flavoring, of course! Flavors are available from a wide variety of sources, but we are 100% confident you will want to enjoy the advantages of DIY Flavor Shack Inc. flavors when creating your favorite formula. Our flavors offer a taste experience you won't find anywhere else, because DIY Flavor Shack Inc. has designed flavors specifically designed for inhalation rather than the food flavoring used throughout the industry. Our recommended dilution ratio is 10% flavor for DIY Flavors and 5% for Flavors Array rather than the 20%+ you'll find in other flavors. That means a bottle will go twice as far for you , and allows for a higher VG mix. We are adding DIY Flavors as fast as we can get them, so check back regularly if we don't currently have a flavor you are looking for. You can make E-Liquid without flavor, this is commonly referred to as "neat" E-liquid. This is of course not a common vape choice, however, DIYing is probably the only way you will get "neat" E-Liquid if you want to try it. Bottles - At a minimum, you will want some bottles. Plastic drip tip bottles tend to be the most cost effective option for experimentation, because getting bottles clean enough to re-use for a different flavor tends to be more work than it is worth. While you will use less raw materials for each variation batch, the trade-off for using smaller bottles for your experimentation is that your math and measurements will need to be more precise. The already small quantities you are working with may be harder to measure accurately when working with a 10mL total volume than a 50mL. Syringes - Syringes and pipettes are an essential tool for helping you negotiate the small openings on containers and getting the right amount of liquid from your supply into your E-liquid creation. They let you extract the exact amount of nicotine, PG/VG, or flavor you need and transfer it to your mixing container. This will help ensure that you can consistently replicate your new creation once your formula is the way you like it. Gloves - Since nicotine can be absorbed through the skin, and even the best of us spill what we are working with occasionally, gloves will be important to have while you are working. Below are step-by-step instructions for making and E-Liquid from scratch. Before we get started we wanted to point out that if you purchase and E-Liquid that you like, but it needs a little something, you can certainly just add a few drops of flavoring to give it that kick that it needs. The most important element of the recipe is that it is reproducible. If you make a concoction you love, you will want to be sure that you can make it again! Unless you are lucky or very experience, you aren't likely to get that perfect flavor on your first try. It may take several variations to get it right.The keys to making your formula reproducible are to take careful notes and make precise measurements. Notes will also help you address previous versions as you try new things. A note on measuring...counting "drops" may suffice, but lots of environmental factors can change the true volume of a drop. The smaller your total volume is the more these minor variations can make noticeable changes to a "flavor profile" between batches when you try to recreate your recipe. Using consistently calibrated measuring devices like syringes, and writing everything down about each variation will be an important tool to use as you try new variations of recipes out. The first step is to determine the strength of nicotine you want in your E-Liquid, then figure out how much nicotine you will need. The math isn't too hard, but if you get it wrong you could end up with an unpleasant experience. First you will put on your gloves. (Remember safety is always first) Next we will use a clean syringe to extract 3.6 mls of liquid PG based 100mg nicotine into your syringe. Drawing up just the right amount can be tricky, so the easiest way to make sure we get the right amount is to pull the plunger until you have a little more than is needed. Then carefully depress the plunger to the 3.6ml mark. By keeping the syringe pointed into the container of nicotine when depressing the plunger you can prevent wasting any of your diluted nicotine. Air bubbles in a syringe can really throw off your true measurements. If you notice any air in the syringe point the needle up, tap the syringe to get the air to the top, then carefully depress the plunger until the liquid just starts to appear at the tip of the needle. Then you can point the needle back in the container and depress the plunger to the right measurement. Once the amount needed is in the syringe, you can just squirt it into the bottle that you will use for your first trial batch. Now you just need to add the flavor. You can use any flavor combination you can imagine, but for this example you will only be using one flavor. It is important to note that when using multiple flavors together to not use more than 25% total flavoring in your recipe. This can result in a bad tasting E-Liquid. It is always smart to start with less and add more. Flavors Array start with 3-5%, creamy flavors like Vanilla Custard and Metro Man start at 10%, Tobaccos start at 10%, Fruits start at 5-8%. When making your E-liquid determine the type of flavoring you are going to use and the starting percentage. Say we are going to use a Flavors Array flavoring. AR Yellow Mango to be exact. We will want to start off by finding out what 3% of the bottle we are using. Just like measuring the nicotine we will multiply 3% x 120 = and this will give us the amount of mls needed to flavor your E-Liquid. Be aware that flavor concentrates are very complicated artificial flavors. Adding more flavoring isn't necessarily going to make it taste better. Over flavoring your E-liquid can "wash out" the flavor making it taste more like the chemical constituents of the artificial flavor rather than the intended flavor, or worse, lead to a very bad experience. (Ask anybody who has accidentally vaped undiluted flavoring; it is not pleasant). If you are using DIY Flavor Shack flavoring you will probably want to keep the total volume of flavoring at 10%-15% of the total volume of E-liquid. Maybe slightly more or less depending on which flavors you are using. If you are using other flavor concentrates, the recommended dilution tends to be 20-30% throughout the industry. You will want to check the recommended dilution from those manufacturers. You should also know that when you mix multiple flavors, they may come out tasting much different than you'd expected. Sometimes good and sometimes bad. Sometimes you just need a little hint of something to bring out or balance the other flavors you are using. As you experiment, you will begin to see this effect. It only takes a tiny bit of DIY Flavors to make a big difference in your formula. Sometimes it is a good idea to try a flavor all by itself with just PG/VG to get a sense of the individual flavor profile before you add it to a recipe. Now it is time to add your VG and PG. Your VG to PG ratio will determine the amount of each that you will be adding to your E-Liquid. A simple way of tracking this would to write down the percentage of each products containing either PG or VG in two separate columns on a piece of paper. When the percentages are added together, you can then determine how much of each is in your recipe. Start by writing down the percentage of nicotine you used under the appropriate column. (e.g, if you used 100mg PG nicotine @ 3% you would write down 3% under the PG column. If you used 100mg VG nicotine you would write down the percentage under the VG column. If you used 50/50 nicotine you would cut the percentage in half and put it in both the VG and PG column. The same idea is applied to the flavoring. If you are using VG flavoring, whatever percentage you used would go under the VG column and the same if you used PG based flavoring. 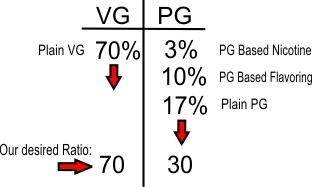 Now you can determine how much plain VG and/or PG is needed to reach your desired PG/VG ratio. The image below will give you an idea on how it works. After you have determined how much base to you add you will measure it out and add it to your recipe. 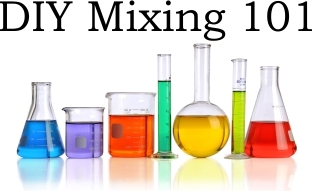 Get the perfect starter kit to get mixing right away!!! Remember to add your flavorings in the boxes provided and select which base you would like for your nicotine! CONTENTS OF DIY KITS ARE SUBJECT TO SUBSTITUTION AT ANY TIME!!! Please note that you can select flavors that are sold on this site. If we do not offer the flavor you have selected they are subject to replacement with a similar flavor.